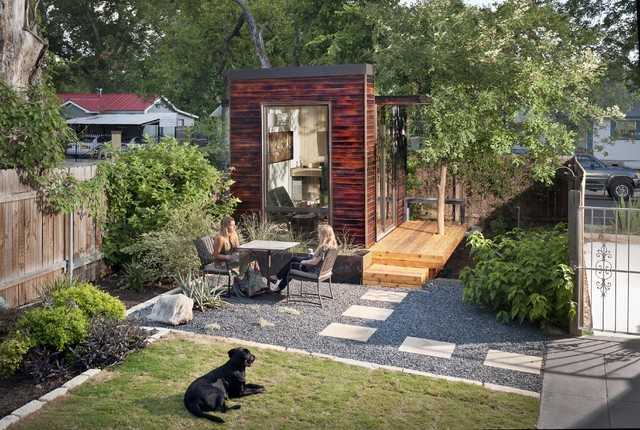 For those with a large enough backyard, a simple home office or studio can completely revitalize the way that you work. A home office is a necessity for many families, but often become a catchall space where papers and documents are dumped, computers are taken over by kids, and décor is an afterthought. By moving your office outside, however, you can create a haven – a place to work, create, and explore, enjoying the nature and solitude. Whether you work from home, or merely bring your work home with you, having a backyard studio office(link to backyard studio plans page) that is conducive to getting things done without distraction can be a lifeline. Rather than dealing with the constant interruptions an in-home office can entail, a backyard structure can become your office-away-from-the-office, a sanctuary where you can work in a controllable, disciplined, distraction-free space. Rather than deal with the time and expense of designing and building your office, a backyard studio plan can take the guesswork out of constructing your new home office. However, there are still many factors to take into consideration before you begin. When searching for the perfect backyard home office for you, you must first decide how large a space will fit your needs. You want to ensure that you have enough space to work comfortably, without feeling cramped, but also ensure that the constructed office does not overwhelm the entire backyard. That’s why starting with a backyard studio plan that has been tested is ideal. You have the freedom to choose an exact size and truly customize your home office(Link to home office CDC) to fit the outdoor space you’re placing it in. It is also important that you research the bylaws of your municipality to ensure that it is legal to build such a construction on your property. Generally, any structures larger than 100 sq. ft. require a permit in order to be built, as are most properties that have electricity or plumbing. Additionally, depending on the circumstances, your home office may be considered a commercial property or “habitable space,” which are subject to the same permit requirements and building codes as your main home. While building permits are an easy thing to overlook, it is worth a small investment of time now to find out thezoning laws of your municipality now, in order to avoid a much larger headache – or even a fine – in the future. Depending on how you envision your perfect backyard office, you may not need to worry about setting your structure up for electricity and indoor plumbing. Potentially, your “office” may require no electricity at all, but in general, indoor lighting and outlets are required for maximum efficiency. After all, if you need to run inside the house every time you need to print out a document, your backyard office is not really serving its purpose. If you get cold winters, you may also wish to have heating elements, either electrical or furnace, that may require additional installation and permits. If you intend to have indoor running water or a more extensive electrical system, unless you have extensive experience, it would be wise to hire a contractor(Link to installation help page) to guide you through the process. Customizing your backyard studio’s exterior can be the perfect way to integrate it into your backyard, creating a fluidity of style that suits your aesthetic tastes. Have fun with the exterior to create a bold design concept, such as vine-covered walls, an all-glass enclosure, or play with color and material to create texture and visual interest. Once you have chosen the perfect exterior, extend the aesthetic inside through your interior wall finishing’s. Trims, lighting fixtures, and color and texture of drywalling are all small elements that can have a big impact on the overall look of your backyard office studio(link to backyard studio plans page). Thermal doors and windows can also have a big effect on both the style and functionality of the space, keeping you comfortable in all seasons. And keep in mind the landscaping of your backyard and home – even though the interior of your backyard studio may not be directly visible from the outside, keeping your design cohesive and consistent throughout your spaces can create a comfortable, appealing space. Once your exteriors and interiors are complete, you can have fun with the interior décor! Since this will be your principal space, make sure that your design preferences are addressed. Your space should reflect your tastes, and if you have a spouse or children who have taken over the aesthetic of the main home, this may be just the chance you’ve been waiting for to create the perfect space especially for you. When choosing design elements, including furniture, fixtures, and wall treatments, make sure that you are also creating a space that will maximize your ability to work. If you use a lot of electronics for your work, invest in furniture that enables you to hide cords and keep bulky technology unobtrusive to create a clean, organized look. While you may love bright walls and wild pops of color in accessories in your home, choosing distracting design elements can pull you away from your work. Clean lines, neutral colors, and adaptable furniture can take maximum advantage of the available space, and create a soothing environment that can keep you on task. Once you’re perfect backyard structure has been designed, constructed, and decorated, make sure the backyard itself is as stylish as your backyard office, art studio, or man cave. Try adding a porch to your studio for when you need a breather from work or just want to soak up the sunshine, or add a garden pathway between the main house and the studio to create perfect fluidity and connection between the two structures. Finally, make sure your backyard has adequate lighting to ensure that you don’t end up fumbling in the dark after a long evening of work. Hanging lights, standing torches, are theater-like base lights along the walkway can provide style and functionality to complete your perfect backyard look. Whatever your idea of the perfect outdoor work space, with a little work and planning you can create it easily and cost-effectively. 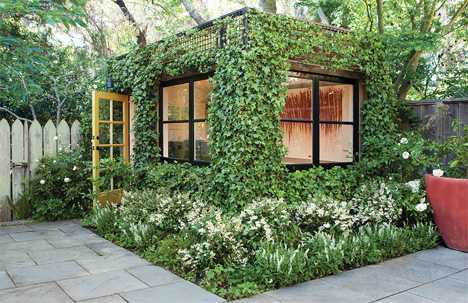 Do you have a backyard or garden office or studio? Have you thought about building a studio, but are unsure of how to get started? Let us know your thoughts, questions and what’s helped provide you with inspiration in the comments!